The myMCPS Portal is a 21st century digital learning environment specifically designed to meet the needs of staff, students, and parents of Montgomery County Public Schools. From teaching and learning to community outreach to professional development, myMCPS Portal is the next generation classroom. Access to the myMCPS Portal will be available online and through a mobile app. Parents will receive activation information for their Parent Portal account during the second week of school by US Mail or email. Please be on the lookout for this important information. Students will activate their Student Portal account at school during the first week of school with their teachers. Students must use their school assigned screen name and password. Please do not change student login information. The app will provide direct access to content available on the MCPS website, including information about schools, the school year calendar, lunch menus, and the Board of Education. 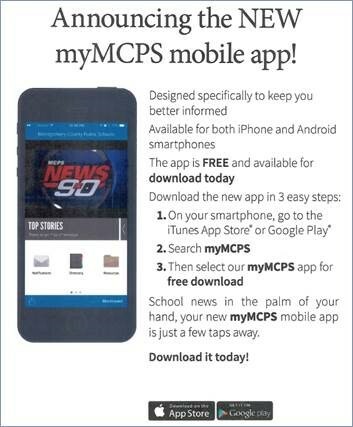 Those who download the app will have the option to receive "push notifications," or alerts on their phone or tablet about important MCPS news and districtwide emergency closures or delays. For support, please email myMCPSSupport@mcpsmd.org and a member of the team will get back to you soon.